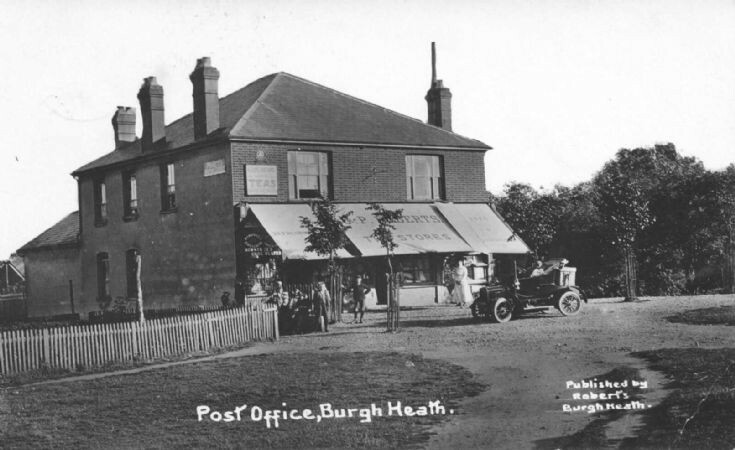 Roberts Stores, incorporating the Post Office, at Burgh Heath. This postcard is postmarked 1912. The location is believed to be where Travis Perkins is now located on the A217. I had to use Google Street view to find Travis Perkins! Yes, this is the old Roberts Stores building. It was set back from the road and had a roughly semi circular entrance drive not dissimilar from the TP one today, except that it may have been a little further from the single carriageway A217 and it wasn't surfaced. Roberts provided a grocery delivery service and my mother used that. I can't remember the make of van (possibly Morris Commercial? ), but it had a side access facility. Also set back from the road between the Stores and the village hall was French & Foxwell garage where Cooper garage now is. That access road was also unmade - not uncommon for minor roads even in the 50s!